For me, the greatest issue in NZ High School Music Education is how do we get more schools teaching Music Technology – i.e. using MIDI and audio (microphones, DAW’s, interfaces, etc) to produce music. While I’m a huge believer in teaching reading music and notation (in my professional career most of the work I got was because I was known as one of the few good sight-reading bass players in town) the reality is that these skills are of less importance to students wanting a career in pop and rock music. For these students, knowledge of how to produce with Logic or Pro Tools is of a lot more importance. Now, I know that if I wrote this on the Artsonline Musicnet email network (an email network connecting NZ High School Music Teachers) the daggers would be out with plenty of people attacking me (but also plenty of people in support). But in all my reading, research and experience running a recording studio and teaching high school for over ten years I’m becoming more and more convinced of the importance of music production skills using technology. Let me say out front that this is not my background. I’m not trained in music technology. I have two music degrees majoring in classical and jazz music. But the longer I’m involved with the music industry the more I see the need to train our high schools students for the realities of our music world. The simple fact of the matter is that if they are into Pop or Rock, then it’s more important to know how to produce music with a DAW than it is to be able to read Figured Bass or to be able to analyse Sonata Form. My business, Learning Ideas Ltd, has been providing Music Technology workbooks for the New Zealand Unit Standard system for the last few years and as best I can tell, these workbooks and tutorials have been of great help to many students. I have also been running workshops for teachers all over NZ for the last few years. And while I think these are very positive and helpful sessions for teachers I’m mindful of the fact that many teachers are overwhelmed with information. What many teachers need, particularly older teachers, is someone to walk along side them in the teaching of their first year of music technology. By all means use the workbooks and tutorials from Learning Ideas but teachers should seek the help of someone else who knows the ‘content’ very well (even if they’re not trained teachers). These might be teachers at other schools, but probably not as most teachers are struggling with the workload at their own school so can’t help other schools too much. So far, I think the solution lies with our Tertiary providers. Places like MAINZ, SAE, CPIT and Universities that are running music production courses (like Massey, Auckland, etc). Teachers should seek out the people who run those music schools to find the best students in their 2nd, 3rd or 4th years of study. After all, in NZ, everyone involved in the music industry is involved in education in some way so getting ‘placement’ into high schools to assist teachers can only be good for those Tertiary students. And because they’re not qualified yet teachers shouldn’t have to pay them too much! (Teachers need to remember though that any resources or teaching associated with Performing Arts Technology Standards can be paid for with STAR funds). I see this as a win/win situation. Teachers can offer Music Production/Tech courses that will attract higher numbers into their programmes, and they can be in charge of assessment. But in the teaching of complicated things like Compressor Threshold and Ratio, Phase, RT, Parametric EQ, and so on… they can have Tertiary students who should know the basics of all the knowledge and basic techniques of use. Teachers will still need to do their own PD (see here for some good options) but the pressure on the teacher to know everything immediately is taken away. I’ll set you up with the resources and I’ll help you touch base with your local Tertiary Music Tech provider who maybe in a position to send some talent students or recent graduates your way. At the moment there are many people involved with the #28daysofwriting and I’m full of admiration for them! I’m struggling to keep up with one blog post per week. To be fair in my defence in the last week I have just setup a full music block and recording studio after the completion of our music dept building programme. 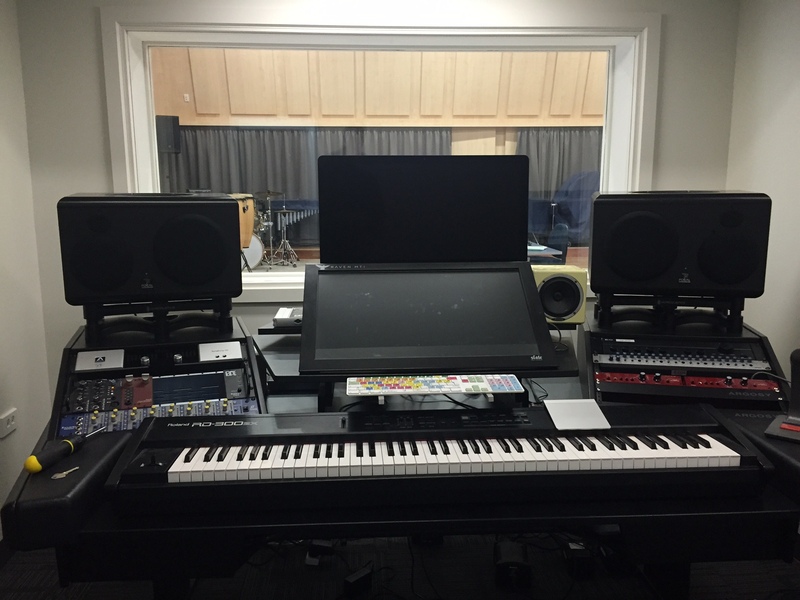 I’ll do a full blog about that soon as I’m sure other teachers will find it fascinating how we’ve created what I think is one of the finest recording studios of any school in New Zealand (and even the world!). So for my blog this week I thought I’d just send you to an excellent blog written by the director of IT at St. Andrew’s College, Sam McNeill. In this blog Sam interviewed me and we discussed all the different processes and pieces of technology that we used in the creation and production of a musical written by a year 13 student of mine, Isaac Shatford. Mr Duncan Ferguson, Isaac Shatford and Ms Ginny Thorner. UPDATE: This story profiled on TVNZ’s Seven Sharp on Friday 24th October and can be seen here. 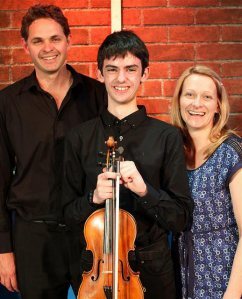 The buzz around St Andrew’s College lately has all been focused on the annual Middle School Production, largely for the fact it has been mostly written by Year 13 student Isaac Shatford, with contributions from a number of other senior students in the area of lyrics and plot. I knew something like this would always involve significant use of technology as the Musical Director was Head of Music Mr Duncan Ferguson, and was actually the first person I interviewed for a story for this blog. On workshops I’m often asked to give an opinion about a certain piece of recording or live PA equipment. There is so much choice at so many price points that it can be really hard to figure out what is best for your school and your students. If you’re reasonably comfortable in the world of music technology then my advice would be to read lots of reviews from websites like Sound on Sound, visit other schools, visit studios and talk to a range of sales people in a range of shops. Never take just one person’s advice (including my own!). The more you become informed of the options the better position you’ll be in to make smart purchases. 3 or 4 Shure SM57‘s – the industry standard mic for recording guitar amps, snare drums (as well as tom’s) and can also work great for loud brass instruments. The most important thing about them for a high school situation is that they’re pretty much indestructible (well, I’ve never had one break on me despite some rough treatment). If you can only afford a couple of mic’s – just get a pair of these, they even work well on vocals (although you might like to consider an SM58 for these). AT4050 Condenser mic – it’s good to have one good quality condenser mic for recording voice, solo acoustic instruments, etc. Get a pair of them and you can make great stereo recordings of choirs and orchestras. There are many comparable condenser microphones from other manufacturers (AKG 414’s are a popular choice) but I love my AT-4050’s. There are a huge range of interfaces available now. If you want one that can double as a mixing desk for a live PA system then I’ve found the Presonus Studio Live desks excellent. I’m particularly fascinated with their new RM mixer series which only has mic inputs and is controlled from an iPad or touch screen computer. However, if you want something more ‘pro’ in terms of the preamps and analogue-to-digital conversion (i.e. better sound) then my pick would be the newly updated Apogee Ensemble. I have the older Ensemble and it’s fantastic (for my studio I also use the Symphony but that is probably out of the budget range of most high school departments). See my previous posts here and here where I discuss what is the best Digital Audio Workstation (DAW) for high schools. In the past I’ve had Tannoy Reveal’s, Behringer Truth’s and Mackie HR824’s. But I’ve never really been happy with any of them. Don’t get me wrong, for a high school situation they’re fine. They were durable and gave a big sound. But all of them suffered from not being overly ‘even’ across the frequency range – usually too bassy. So I consider myself very fortunate to now have Focal SM9‘s, but these cost crazy money. But… based on reviews I’ve read recently I’d say some of the best monitors at reasonable prices would have to be the Presonus Sceptre’s or any of the mid-priced options from Focal, Adam, KRK or JBL. Of course you’ll also need things like cables, mic stands, speaker stands so don’t forget to allow budget for those. Where do I purchase all this from? Well, I like to support local stores but online the best website I come back to time and again is Sweetwater.com. Their service has been faultless. The other store that has given me great service and good educational discounts is Vintage King (if you ever get the change to visit their LA store make sure you do, it’s amazing). Audio equipment preferences can be very personal so I do encourage you to do your research. Don’t get too hung up on reading forums like Gearslutz (too many contrary opinions there!). The best thing to do is to find other schools that are into music technology and visit them to find out what works. In my last blog post I demonstrated a good starting point for teaching students how to mix. After six weeks or so of having my students mixing using only faders, panning and EQ (on a few projects) I then start to discuss the overall picture of the mix process. Advanced students would be required to purchase the excellent Mike Senior book on mixing on Kindle in addition to reading other articles online and visiting blog posts like soundscoop (and a multitude of others). Many recording equipment manufacturers like Universal Audio, AVID, Presonus and many others also offer excellent mixing tutorials and students are encouraged to complete as many of these as possible. However, while we all have some motivated and diligent students, we’re always going to have several that need a little more ‘spoon-feeding’ (which of course we always try to ‘wean’ them off as good parents/teachers should!). It would be great if all students went to these websites and started teaching themselves (which undoubtedly some students will) but for others I’ve done a few guides that may help. (I got this image off the http://www.harmonycentral.com website many years ago and have not been able to find the page for it again so sorry I’m unable to give proper credit to the person that created it). Add ambience with reverb and/or delay. Note, it’s best to try and get this naturally by recording in a very nice room with good acoustics. But if this isn’t possible then record the tracks as ‘dry’ as possible and add ambience in your DAW. Add interest. All of the above just serves the purpose of making sure you can achieve a stable balance and hear everything. But it may not make the mix very interesting. So here you do whatever you need to make the mix dynamic, exciting, original – this is where you attempt to create a piece of great art! I’ll try to do a blog post dedicated to this point in future weeks. I’ve done a video for my students and NZ teachers who are teaching the level 2 27703 unit standard, showing how to do a basic mix in a live setting. Here I’m using a Presonus Studio Live mixing desk and have the audio tracks streaming from my laptop to the mixing desk (rather than having a live band in the room). I find this mixing desk a great tool for teaching live mixing to my students but all the concepts I discuss in the video are equally applicable to mixing in a studio/DAW environment. This video has worked well for my students who may not have followed my in-class demos and may be too nervous to ask questions in front of others as they’re able to replay parts they don’t quite understand. It serves a good way of filling in the gaps for them. Please note, the tracks from this video were downloaded from the excellent Sound on Sound magazine website. In another blog post I’ll go into detail about my assessment processes for mixing with my senior students. Students can’t just do a mix – they have to be able to articulate all their mix decisions and why they made them.